The 601 La Bomba Maduro Warhead is a new limited edition cigar that will be launched at the 2013 IPCPR Trade Show. It will be the seventh blend of the popular 601 line of cigars to be released. For this particular cigar, blender Erik Espinosa takes his powerhouse 601 La Bomba cigar and adds a Connecticut Broadleaf wrapper and a box-press shape. 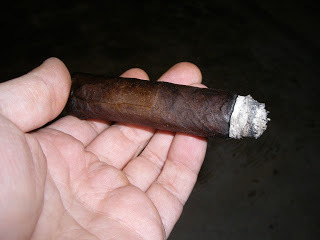 I’ve recently had an opportunity to sample a couple of pre-release samples of the 601 La Bomba Maduro Warhead. Without a doubt there is some magic with this particular blend. The 601 Warhead might just prove to be the best cigar in what is already one of the better cigar lines out on the market today. 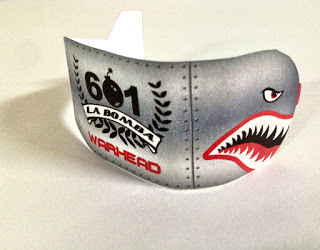 The Warhead becomes an extension to 601 La Bomba’s line. It was in 2011, when the 601 La Bomba line was launched by Espinosa’s formet company, EO Brands. Last year, the EO Brands company was dissolved. The principal partners Erik Espinosa and Eddie Ortega would go on to form their own companies. Espinosa would form Espinosa Cigars and as a part of the split would inherit the 601 (as well as the Murcielago and Mi Barrio lines). The core 601 La Bomba line is a Nicaraguan puro that features a Nicaraguan Habano wrapper. The La Bomba is considered to be the strongest cigar in not only the 601 line, but the Espinosa portfolio. The 601 line and in particulr La Bomba has been getting a push this year. In fact, earlier this year, Espinosa Cigars added a fifth vitola – a 7 x 70 vitola called the F-Bomb. We now turn our attention to the 601 La Bomba Maduro Warhead and take a closer look at this cigar. Given that we smoked pre-release samples, we will default to our “pre-review” format. The purpose of this will be to document our experience and share our thoughts and perspectives. Once the cigar is released, we will revisit the cigar again where we will provide an assessment rating and score. In the press release announcing the 601 La Bomba Maduro Warhead, Espinosa said, “Although the wrapper is different, we are using the same powerful blend as the rest of the line.” The Connecticut Broadleaf wrapper surrounds a blend of Nicaraguan tobacco. The 601 La Bomba Maduro Warhead is only available in one size – a 6 1/2 x 54 box-press toro. As mentioned above this is a limited edition cigar. Only 2,000 boxes of ten are being produced for a total of 20,000 cigars. One can infer that this is a special wrapper that Espinosa was able to secure for this blend – and it is reflected in the appearance. The Warhead’s Connecticut Broadleaf wrapper has a dark roasted coffee bean color to it. There are some oily spots, but I wouldn’t categorize the wrapper as too oily. There are a couple of visible veins. The wrapper’s dark color does a nice job at hiding the wrapper’s seams. You can also detect a nice cocoa aroma from the wrapper. 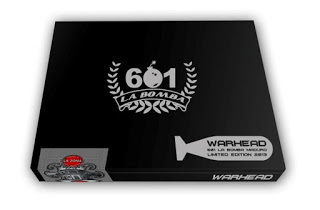 Like the original 601 La Bomba, the Warhead has a long pig-tail fuse to it. Of course, at the center of the band is the “601 La Bomba” logo in black and white. That logo is highlighted by bomb for the “0” in “601”. It also has the text “LA BOMBA” in black font on a white ribbon. Underneath the logo is the text “WARHEAD” in bold red font. As tempting as it was to pull off the long pig-tail fuse, I still opted for a straight cut to remove the cap. After clipping the cap, it was time for the pre-light draw. I found a nice amount of flavor nuances on the dry draw as I detected notes of leather, cocoa, cedar, and citrus. Overall, I was quite satisfied with the Warhead’s pre-light draw experience. At this point I was ready to remove the band from the footer and begin the smoking experience. The start to the 601 La Bomba Maduro Warhead delivered some notes of coffee, leather, white pepper, and background citrus. The coffee soon took on some chocolate flavors and became more of a mocha flavor. The mocha emerged as the primary flavor with the pepper and citrus closely behind it. In the early stages, the pepper tended to linger on the tongue on the after-draw. There were also some earth notes that surfaced. At times these earth notes were background flavors and at other times it was in the forefront. Meanwhile the retro-hale had some nice things going on. Not only did I detect the white pepper through the nasal passages, but I could detect some citrus and coffee as well. In the second third of the Warhead, the mocha flavor now had some classic natural maduro sweetness qualities to it. Meanwhile the pepper was now pretty much on par with the mocha flavors. At the same time, the citrus and earth remained more of a background note. By the last third, the pepper notes took over slightly – with the mocha and earth notes close behind. Much of the citrus flavor had dissipated as well. The spice never overpowered the end of the Warhead. This nub was a true finger burner – cool in temperature and firm to the touch. 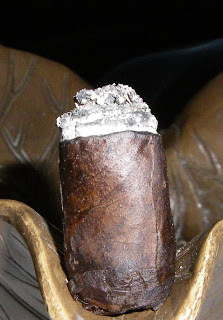 Overall, the 601 La Bomba Maduro Warhead performed excellent in both burn and draw attributes. The burn line remained relatively straight. The ash produced a nice white color. For the most part the ash remained firm. On each of the samples there was a time where the ash did tend to flower, but this proved to be nothing major. The burn rate and burn temperature were both ideal. As for the Warhead’s draw, I found it to be stellar. It had that touch of resistance – which is always my personal preference on a draw. This made the 601 La Bomba Warhead a very enjoyable smoking experience. When the 601 La Bomba line was released a couple of years ago, it was positioned as the strongest cigar in the line. Since moving over to Espinosa Cigars, the La Bomba has maintained its reputation for being a full strength, full-bodied smoke. With the case of the Warhead, it also is a full strength, full-bodied smoke. I did think both the strength and body of the Warhead were a slight notch down from the core La Bomba line, but its still very much kept both of these attributes in the “full” range. I found the core 601 La Bomba line did an excellent job at keeping a balance between strength and body. The Warhead also does a excellent job here – with neither attribute overshadowing or having an edge over the other. This is simply an outstanding cigar. This is as good a full strength, full-bodied maduro that I have had. 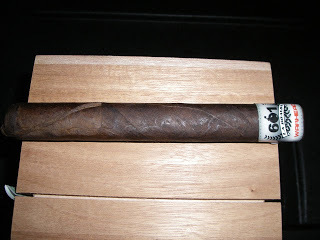 While I very much enjoyed the core 601 La Bomba, I found the Warhead to have even better flavor and more complexity. The bar has been set high over the years with the 601 line – and the Warhead easily eclipses it with flying colors. Once its released, if the experience of the Warhead is similar to what I got on the pre-release, this could go down as some of Espinosa’s best work to date. The only drawback could be the limited production might make it harder to track this cigar down. Given its a full strength, full-bodied smoke, this is a cigar I’d only position to a more seasoned cigar enthusiast. As for myself, this is a cigar that I’d easily consider a box-purchase for. Source: The cigars for this pre-review were supplied by Espinosa Cigars. This request was initiated by Espinosa Cigars in order to provide feedback. Cigar Coop is appreciative to samples provided but this plays no role in a final assessment rating and write-up.